First of all before I go into detail with my question I should mention that I have already read the similar question page "Why can't I get a decent white background with product photography?" The lighting setup and camera settings in this question are different to the question above. I would like to photograph the subject on a white seamless background (#ffffff) using continuous lighting without having to do any post editing in order to achieve the final outcome. The camera is always set to Manual mode, and the ISO is set to a fixed setting of 100. I am unsure of the settings for Aperture and Shutter Speed though it seems turning the outer dial on the camera increases the brightness of the photo by affecting one or the other. The subject appears over-exposed and there are grey areas that are not seamless white on the corners of the background. For the second test, a boom pole with a soft box attached is positioned above the subject. This second method appears to fully light the white seamless background, though again the subject is over-exposed. In conclusion, I would like to find a way of achieving both a white seamless background while making sure not to over expose the subject in the center of the photo, using continuous lighting without having to do any post editing. From the feedback of the first setup I have moved the positions of both the background/foreground lights and the position of the subject away from the background lighting. I have also replaced some of the lighting kit from 135W light to 20W continuous lighting and using 10W LED flood lights for the background. With Test 1 there is still over exposure on the subject similar to before. In tests 2 and 3 with the camera dial turned down the top of the subject is much clearer on the white seamless background. I would like to find a way of fully filling the background with seamless white without over exposing the subject on the background. Insure that the lights illuminating the background are as close to the background as you can place them without being visible in the scene or creating uneven brightness on the background. Also insure that none of the light from them is spilling onto the subject. You may need to increase the distance between the subject and the background. Insure that the distance between the lights shining on your subject is a greater distance from your subject than the lights illuminating the background are from the background. Pull the lights shining on the subjects back until the ratio you desire between the subject and background is achieved. Normally with white background product photography you want the background to be about two stops brighter than the subjects. If all of your lights are the same power, that equates to having the lights on the subjects at twice the distance as the lights on the background. Try turning the background lights off and perfect the exposure for the subject first. Then start working the background lights in. 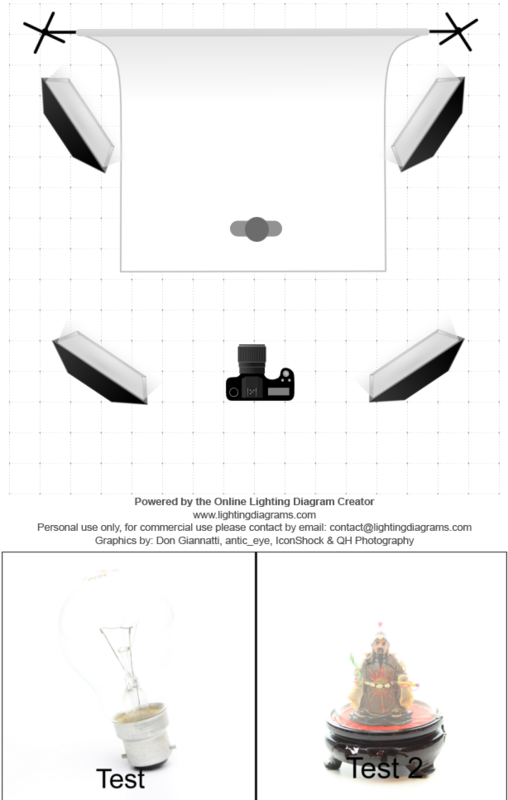 A lot of studio photogs say lighting should be built one light at a time. Start with the foreground lights and adjust your shutter/aperture until the subject is properly lit. Then turn the background lights on and see what happens. If you are using a small space with a lot of white surfaces it can be difficult to prevent the background lights affecting your foreground. But ideally foreground and background lights shouldn't interfere. You could use black flags to try and cut off the background from the foreground or move your setup to a more suitable space. For the lightbulb example (Test 2) I suggest you rest it on a white block instead of the floor, that gives you more separation from the floor and a chance to light the bulb separately from the floor. If the background is a transparent white object (plastic or cotton sheet) give it a portion of it's light from behind, again you are separating the bulb from the background and giving yourself the ability to split your lumens. What is your objection to Post, as it would be easier. Take an exposure bracket or one bright photo (Test 1) and another with a green card handheld (adjust the contrast on the 'green card shot' and drop it on top of the other. That seems faster and cheaper, you might find an Android APP if you don't want to lug a Computer around. You can no easier light a light bulb (externally, to take a Photo) than you could light a perfectly clear window and expect to see it. Can you dip the lightbulb in 1% Molasses to make it minutely darker ? Clear objects are see through by definition, it needs to be 'less than clear' to have some contrast. Four lights on the floor (not hitting the bulb on it's pedestal) one for the front of the white pedestal (to blank it out), one for the bulb to light it (possibly with a reflection), two for the cove, two for the background's front and two for the background's back - that's a lot of expense and setup to avoid a couple of wires and a bit of Post, but it's possible to do it your way. Not the answer you're looking for? Browse other questions tagged background overexposure color-white continuous-lighting or ask your own question. How do I properly do shadowless product photos? What is the best way to photograph an object when the background has to be replaced in post? How can I further decrease the exposure in a studio environment?